Mmm pizza… but it’s going to cost you in the calorie department. Takeaway pizza is about 300 calories a slice… so splitting(*) a pizza is going to cost you 1,200 calories. Plus wedges at 150 calories for half a portion, and you’ve gone through over half of a man’s daily calories (two thirds of a woman’s) in a single meal. (*) OK OK… you got me. We might, you know… order a pizza each. And wedges each. But let’s be fair in the calorie comparisons and compare reasonable portions! 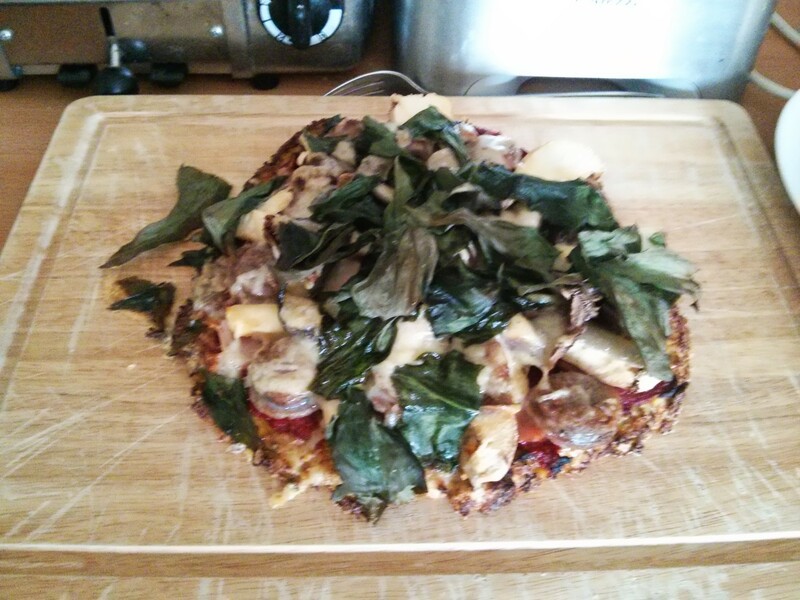 I did my own pizza recently, and it was probably fewer calories than takeaway, but when I saw some blogs (DietitianUK , Nutrition Stripped) talking about cauliflower pizza bases, I knew it was time for a makeover! 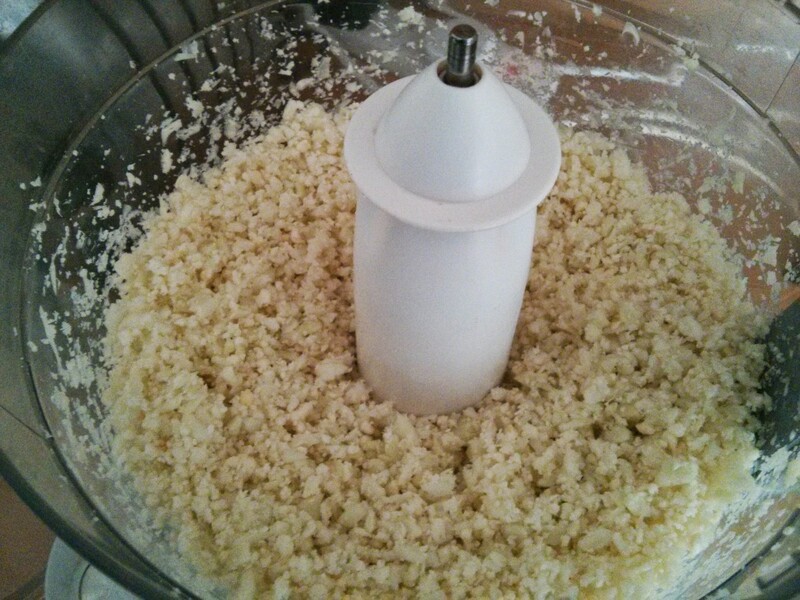 It starts with turning the cauliflower into breadcrumbs in the food processor. This gets microwaved for 4 minutes and then cooled in a sieve. 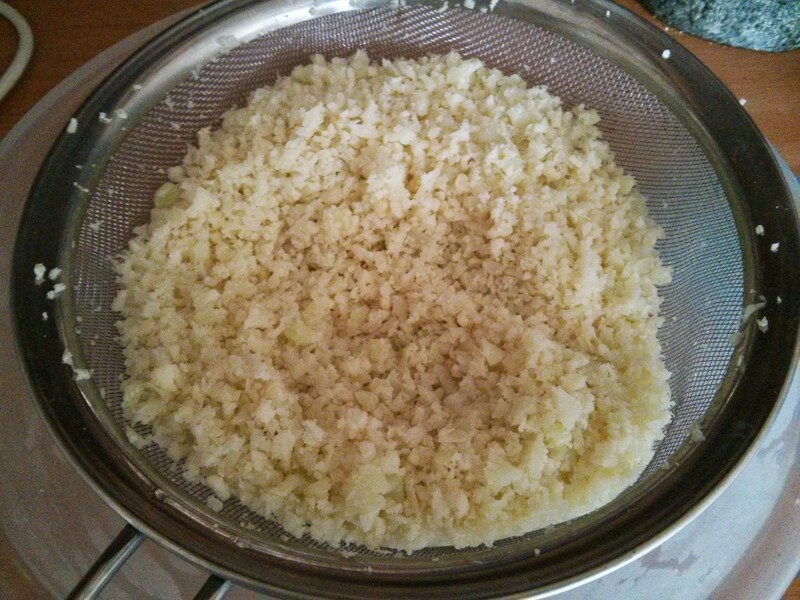 The recipes all talked about squeezing water our of the cauliflower, and I thought the sieve would do this. But it turns out you need to get more serious to get the water out. 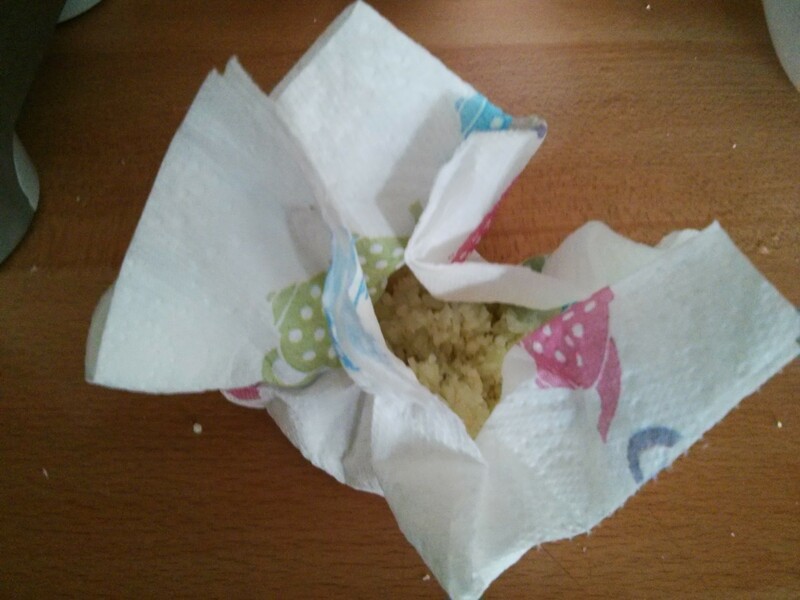 Ideally a cheesecloth… but we don’t have any, so it was paper towels for us! 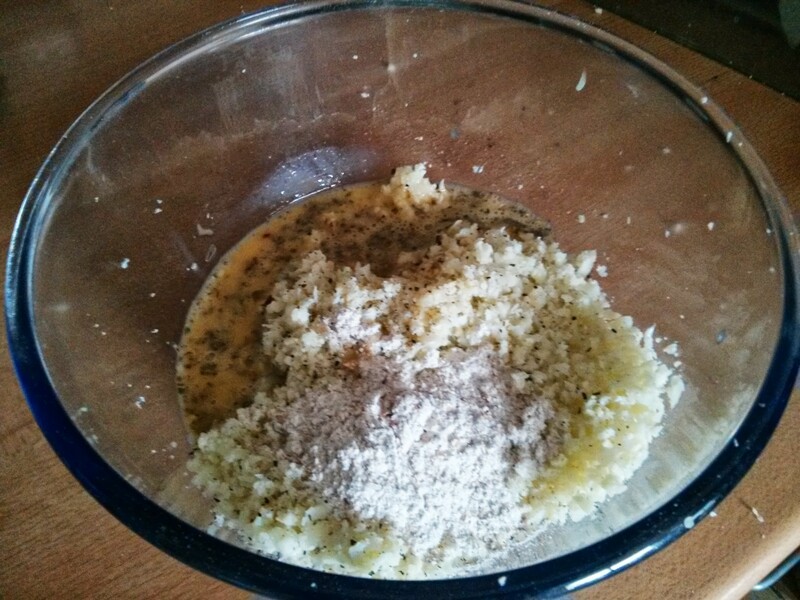 Then it’s all into a bowl and mixing it. 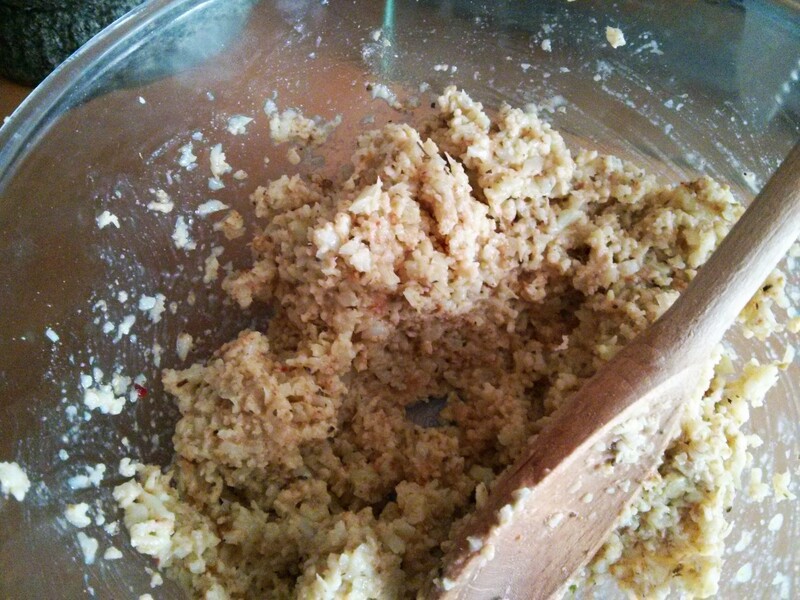 I started with just 1 tbsp of flour, but it felt like it needed more after mixing it in. 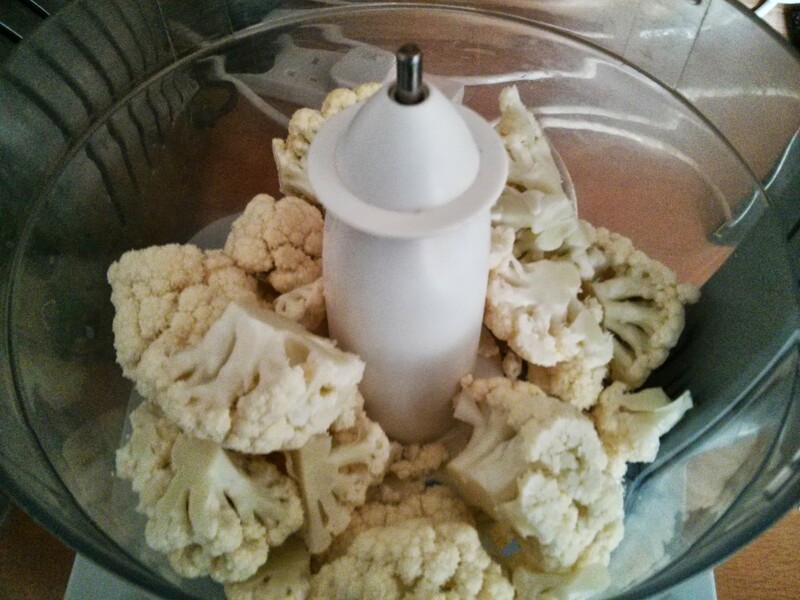 Maybe if I’d had cheesecloth and ben able to wring out the cauliflower properly it wouldn’t have needed it. 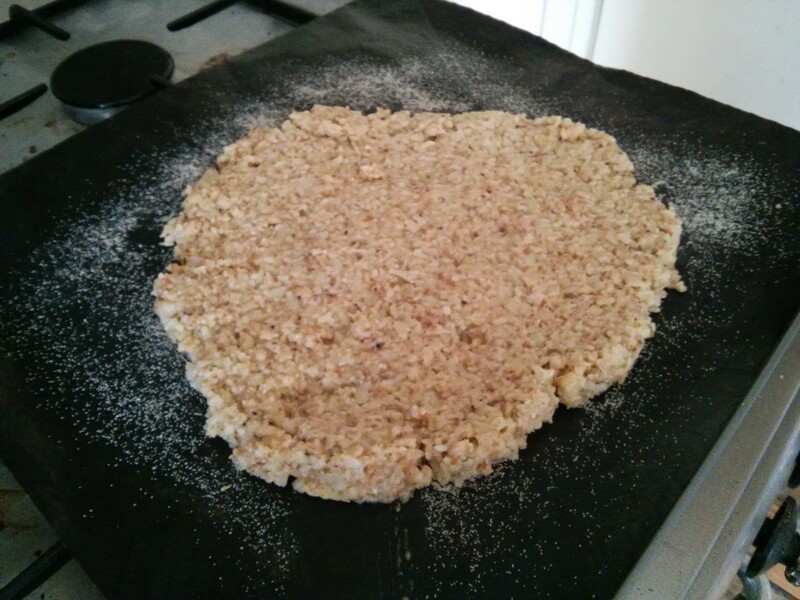 This gets spooned out onto a baking sheet, about 1cm thick, hopefully in roughly a round shape :S I put some course semolina on the parchment to make it easier to remove later. The pizza will take 20mins to blind bake then 10mins with the topping on. 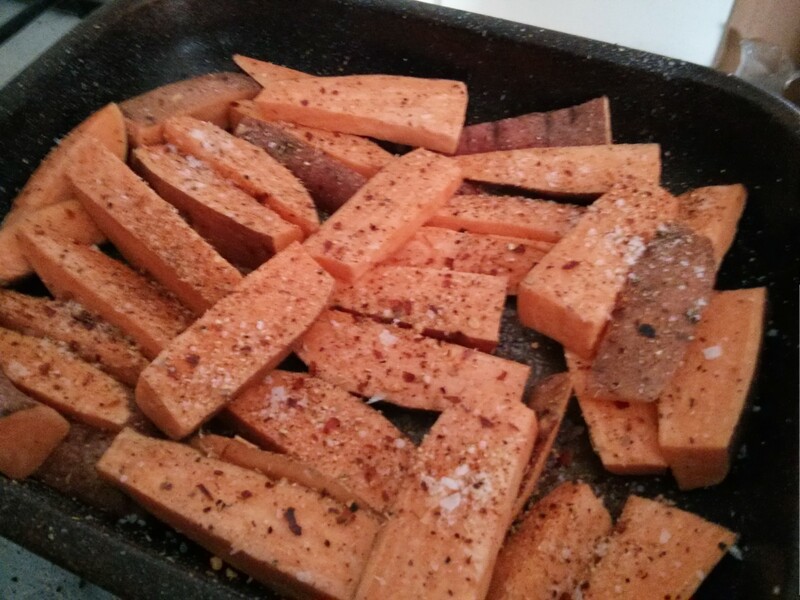 I’m also doing sweet potato wedges, and they take 30mins to cook, so they’re prepped at this point: just wash them, slice them, and season them (salt, pepper & piri piri for us :). So, both go into the oven at 200c fan for 20 mins to start with. While this is happening I prep the toppings. 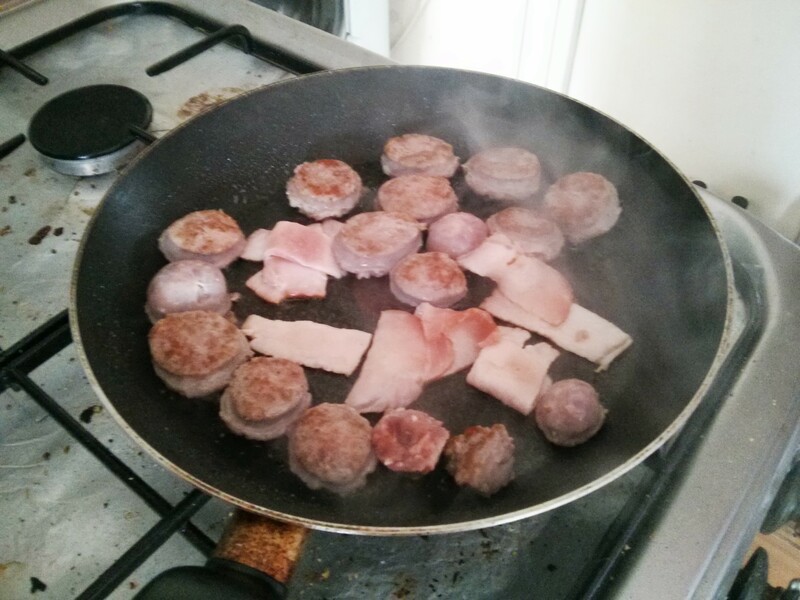 At borough market on Friday I got some nice Italian sausage, and we had some bacon left over from the burgers yesterday, so I fried these up. Also at Borough Market I got some interesting veg. On the left here is wild garlic: the leaves taste of garlic. In the middle is a mushroom called ‘chicken of the woods’. 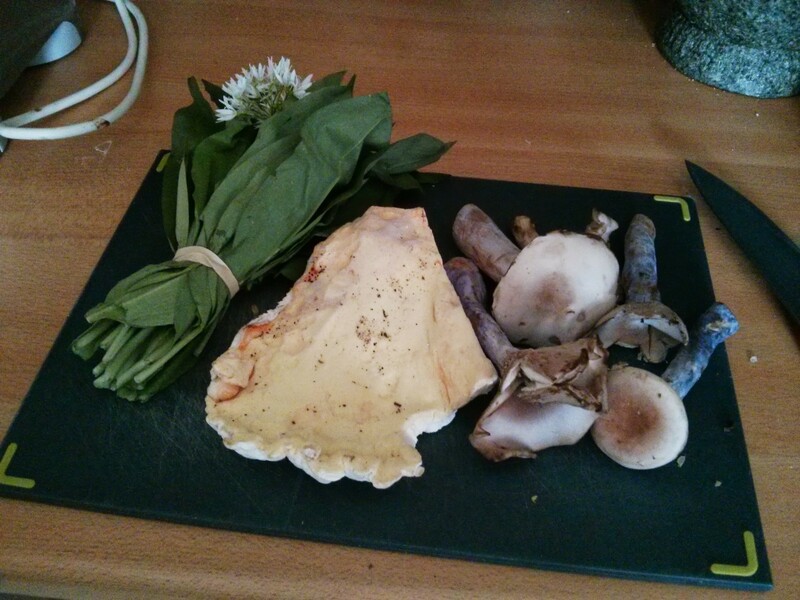 On the right is a mushroom called ‘<something> bleu’ (I forgot the exact name, the important bit is that it’s blue :). 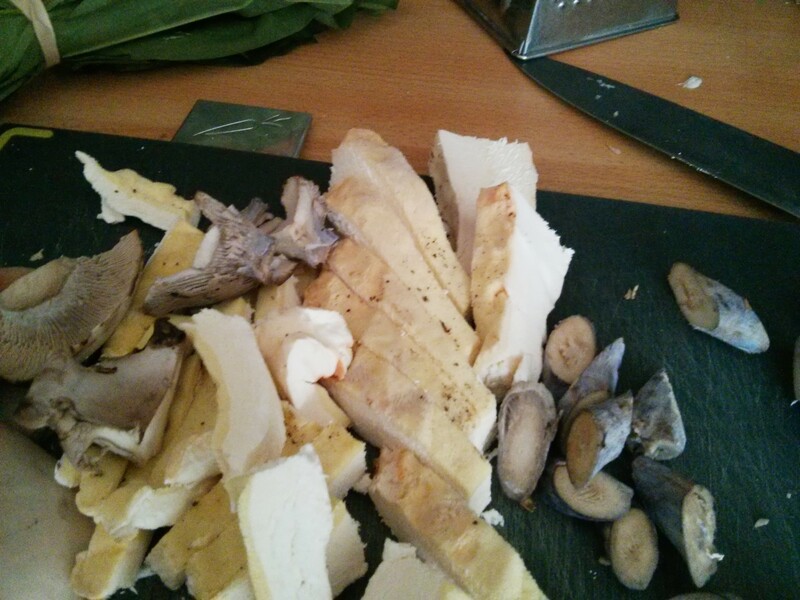 Cutting things up… and that ‘chicken of the woods’ does look a lot like chicken! On top of this I put tomato puree, then the meats, then the mushrooms, then grated cheddar and finally shredded wild garlic. I think this qualifies as ‘fully loaded’! 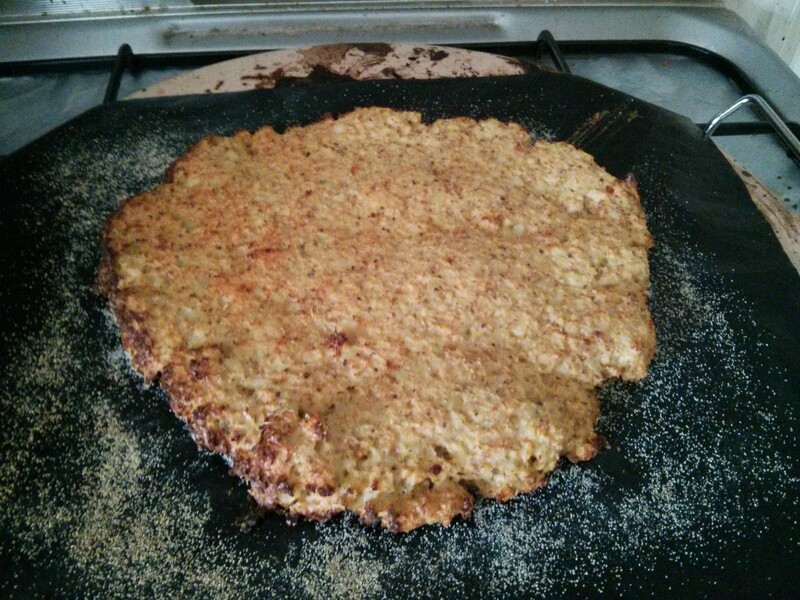 After 10 mins in the oven… it’s looking pretty damned good! No the hard part: moving it onto the tray for cutting… Turns out with my huge spatulas make this pretty easy, and the base held together well. And serve with the wedges, homemade mayonaise, and some (bought) tomato relish. Result? Damned good! The base holds together really well. 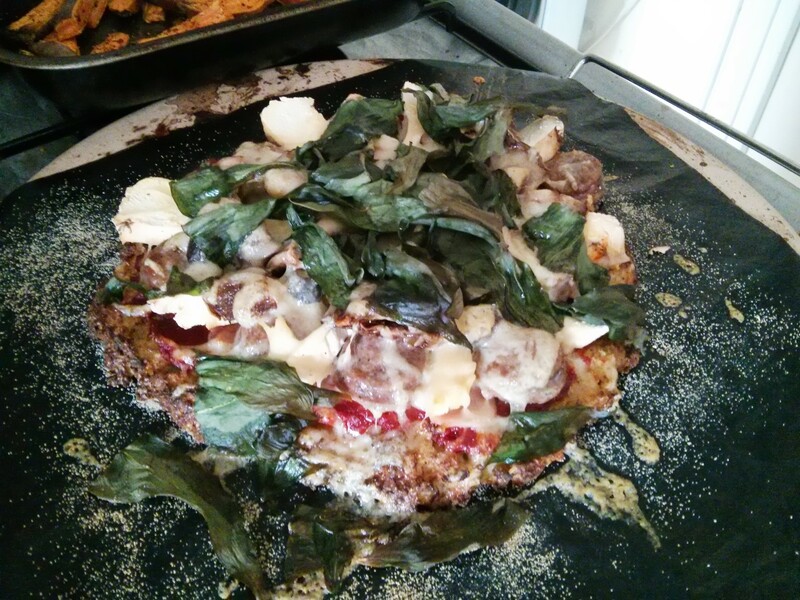 OK it’s not all doughy, but it’s a good base for tomato, cheese and toppings! 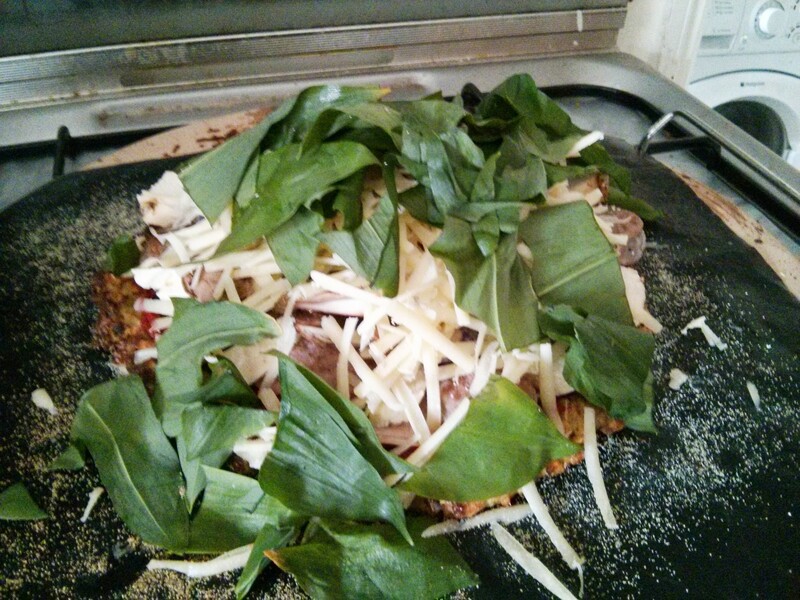 The wild garlic had gone a bit crispy, so this should have gone under the other ingredients, or gone on later. So what about the cals? 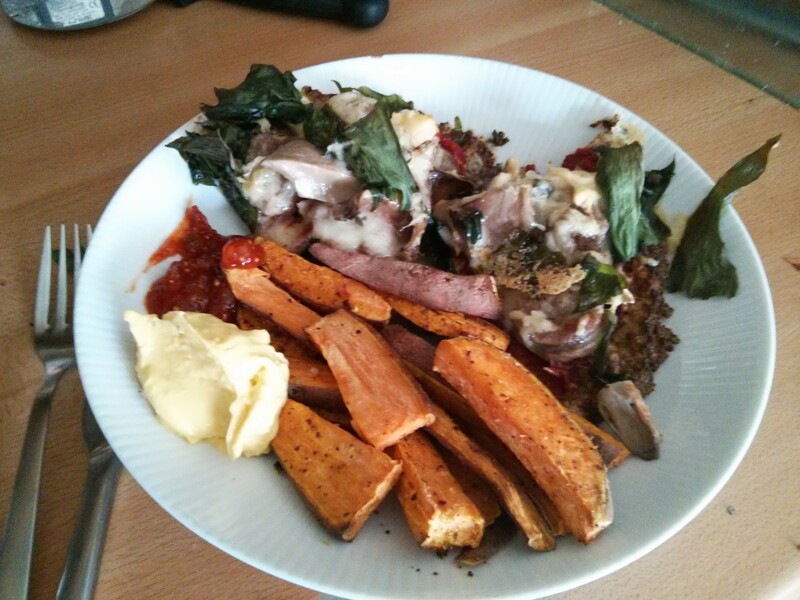 So ignoring the mayonnaise… we’re down form 1,350 for the takeaway pizza to 605kcals for this version. Result! Eat twice as much, and you’re still ahead!